Picking tops and bottoms in the market is really hard. Some people claim they can do it. We’ll let them try. It’s those people who help create the arbitrage between the aware and the unaware. 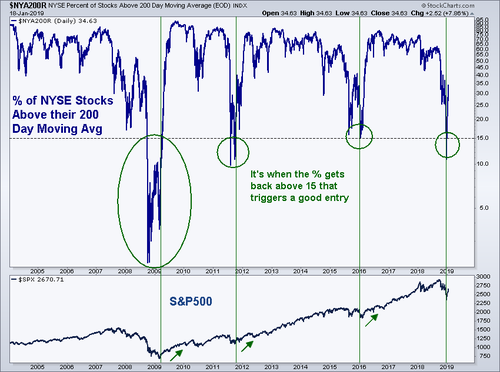 Markets are rarely ever putting in a top or a bottom. Most of the time they’re just somewhere in the middle. My friend J.C. likes to say picking tops and bottoms is the most expensive job on Wall Street. A lot of the media’s time and attention is spent discussing whether or not something is bottoming (housing, stocks, consumer confidence, ratings, etc.) or topping (tech stocks, valuations, bond prices, sentiment). It’s great conversation but not helpful. Because most of the time things are not bottoming or topping. They are middle-ing. They are churning or they are trending. Most of the time, there is no inflection point at hand – these are rare occurrences. So to focus on them to such a great degree is probably a distraction and definitely a waste of time. And energy and emotion. This post probably took Josh five minutes to write and publish to the world. He’s good like that. But I’m not sure that he’s ever put it so perfectly. I think about this constantly. Markets trend. That’s just the way it is. We could spend all day looking for tops and bottoms, or we can use our tools to identify trends and err in that direction. The weight-of-the-evidence suggested the risk was to the upside tactically, regardless of how bearish we were throughout the fourth quarter of 2018. In fact, the last two trades we’ve put on in Breakout Profits have been from the long side. We didn’t know that stocks would go up. It was just the direction in which we wanted to err. We wanted the probabilities on our side, regardless of the outcome. It’s a process. It represents the percentage of NYSE stocks above the 200-day moving average. The buy signal is not when the percentage falls below a certain level. It is well after it reverses and then gets back above that level that we want to be involved from the long side. Either way, the point here is that we’re not trying to pick bottoms. We’re trying to get the chunks in the middle. I would rather buy stocks while they’re already going up, or selling them when they’re already going down. In the case of this chart above, it is the perfect example of NOT trying to pick a bottom, but instead focusing on the chunks well after the bottom has already been put in. Let the suckers try and catch a falling knife. “You know technicians don’t catch falling knives!” the technician responded. The lesson is that we want to let it bounce and give us a point of reference that we can err against. Last month was a great example of that and one we want to point to in the future as a lesson. Many of you started off the year very well and kudos to you. Others certainly struggled. For both the winners and the losers, this is still a good lesson. We shouldn’t just learn from our mistakes, we should also learn from our successes. It goes both ways. The idea is just to keep learning. So to recap, moving in the direction of the underlying trend increases the probabilities of success. It doesn’t mean we’ll always be right. In fact, we know that we won’t. We always want to assume that we’re wrong. It’s not how much we can potentially make that matters most, it’s how much can we possibly lose? What is the worst case scenario? First we identify the risk, then we calculate the potential reward and make sure that we’re erring in the direction of the underlying trend. We’re not picking tops and bottoms. That’s a fools’ game. We’re focused on the middles.